Lobster and Seafood Linguine | Recipes | Oceanfood Sales Ltd. In a large saucepan, melt butter and saute mushrooms, 1/2 cup basil, green onions and garlic until mushrooms soften. Add cream, clam juice and bring to a boil. Simmer for 10 minutes, stirring occasionally, until sauce is lightly thickened. Reduce heat to low and add King & Prince® Lobster Sensations® and remaining basil and heat thoroughly. Remove from heat and toss with pasta. 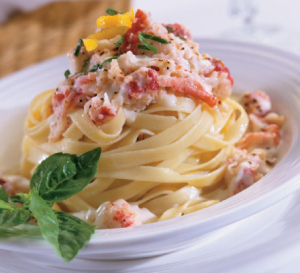 Lobster and Seafood Linguine Recipe by King & Prince Seafood. Learn the benefits of eating seafood.